Public misunderstandings about the cause and impact of air pollution are being driven by poor media reporting in South and Southeast Asia, a new study finds. The media in South and Southeast Asia has helped to build a hazy public perception of air pollution by reporting it superficially, insufficiently or incorrectly, says a new report by Vital Strategies, a US-based public health institution. The report titled ‘Hazy Perceptions’ analyses more than half a million social media posts between 2015 to 2018 in India, Sri Lanka, Nepal, Philippines, Papua New Guinea, Indonesia, Thailand, Malaysia, Singapore, Mongolia, and Pakistan. “Our report finds that public perceptions about air pollution do not match the evidence,” said Anchal Mehta, a member of the study team. Sources of air pollution in South and Southeast Asia as discussed in media and social media. Air pollution causes more than 4 million deaths each year globally. South and Southeast Asia account for around 1.5 million – or 37% – of these deaths. The most important sources of pollutants, such as household fuels, power plants, and waste burning, receive less public attention than sources such as vehicular emissions, the report found. A recent study by Clean Air Collective in India showed that 90% of Indians interviewed across highly polluted cities do not understand the causes and effects of air pollution. “This could be partly because of media coverage that doesn’t reflect the current evidence and science,” the report says. Less signiﬁcant sources of air pollution such as vehicular emissions are mentioned more frequently than more signiﬁcant sources like power plants and waste burning. Another study carried out by Vital Strategies in India in 2014 and 2015 showed that the majority of news about air pollution omitted information about the major health impacts or the effect on vulnerable populations. In India, focus on vehicle emissions was disproportionately high compared to other sources. The debate was dominated by the Delhi government’s odd-even number plate rule (restricting which cars can be on the road on what day), with vehicle pollution understood as the number one pollution source. Vehicle pollution was still seen as a number one source in other countries as well, followed by cooking and natural wildfires. “There is a gap between commonly discussed sources and actual sources of air pollution. Although power plants, burning fossil fuels, and waste burning are major sources for air pollution in many countries, they do not show up among top sources,” the report added. Even though the 2015 haze from forest fires that affected Singapore, Malaysia, and Indonesia was widely reported, vehicle pollution remained the most discussed source of air pollution that year. Sources of air pollution in India as discussed in media and social media. The media has also focused on short-term health effects rather than more serious long term threats of air pollution. “News and social media posts largely mention short-term health impacts such as coughing or itchy eyes, far more than health threats caused by chronic exposure, such as cancer,” the report claims. Beyond deaths, air pollution causes disability from lung and heart disease, contributes to diabetes, inhibits physical activity, and negatively influences children’s physical and cognitive development. Between 2015 and 2018, most of the conversations in the media and social media mention acute symptoms (75%) while mentions of chronic illness were less frequent (25%). “This reflects an important gap in awareness of air pollution exacerbation of chronic cardiovascular and lung diseases, which account for the vast majority of deaths from air pollution,” said Kass. Conversation on chronic and acute non-chronic illness in South and Southeast Asia. How to influence the debate? The report recommends evidence-based communication campaigns to highlight the most significant sources of air pollution and to address the health hazards of long-term exposure. “Another critical step is ensuring that media professionals and key advocates for clean air are informed about credible data on the sources of air pollution, its health impact, and solutions, said Mehta. Interestingly, the report says the public health authorities do not influence the conversation on air pollution, but a photographer, international NGO Green Peace and an activist were on top leading influencers list. Air pollution is most frequently discussed from September through December when air quality is worsened by the winter season and crop burning practices adopted by farmers. The report has pointed out the seasonal reporting as a challenge for engaging the public to support effective air pollution control, which requires year-round, sustained measures. The report also found that the posts about the effect of air pollution on children received more engagement on social media. “There is a clear disconnect between public understanding of air pollution and reality. While people are aware of the problem, there is a need to elevate concern about the impacts of air pollution on human health as well as the environment,” Mehta added. Indonesia “I can keep my land fertile and I’m able to work regardless of the season, but my neighbor who uses the burning method has difficulties during the rains because their land becomes a swamp,” said Akhmad (Taman) Tamanuruddin, addressing delegates at the launch of a new peatland research center in Indonesia. Taman is a farmer in Palangka Raya, the capital of Indonesia’s province of Central Kalimantan on the island of Borneo. He rejects the traditional local practice of using fire to clear residue from the fertile peatlands before planting his crops. Instead, he applies herbicides and lets the old vegetation die off and decompose, allowing it to become a natural fertilizer. Traditional burning practices are under scrutiny by scientists and policymakers because peatlands are effective carbon sinks. They are made up of layers of decomposed organic material built up over thousands of years. When they burn, warming gases are released into the atmosphere exacerbating climate change. Fires often burn out of control, damaging vast areas and drying out the land, rendering it useless for farming. In 2015, the impact of wildfires was far-reaching. Fire destroyed more than 2.6 million hectares of land — an area 4.5 times the size of the Indonesian island of Bali, according to the World Bank. The price tag for the damage was more than $16 billion, the bank said. Indonesia has since boosted efforts to ban the use of fire to clear forested peatlands to plant oil palms, maize or rice by establishing the Peatland Restoration Agency in 2016. Legislation banning fire use to clear land was introduced in 2009 and 2014. Research compiled in Riau province by Indonesia’s Forestry and Environment Research, Development and Innovation Agency (FOERDIA) of the Ministry of Environment and Forestry (MOEF) shows that land prepared by burning vegetation before planting is more productive. They examined peatlands cultivated for oil palm, rubber, corn, rice, and other food crops. Oil palm yield in burned peatlands was found to be almost 30 percent greater than in those that were not, producing yields of about 13.3 tons per hectare a year. In peatlands that were not burned, yield was only 9.4 tons per hectare a year. Rubber tree yields were found to decrease on average by 46 percent if the land was not burned. Corn yield disparities were even more extreme. 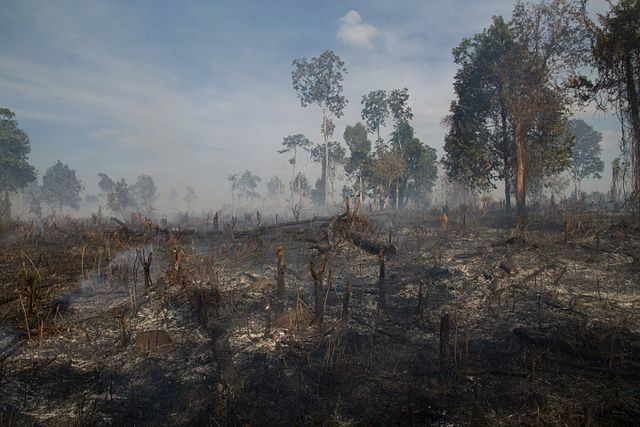 Burning resulted in higher soil fertility in the peatlands. It also reduced acidity, contributing to the higher yields. Aware of the yield benefits, many farmers involved in the study disregarded prohibitive legislation and burned off their fields. Of the study participants, only 49.3 percent stopped the practice, while 45.2 percent of respondents continued and 5.5 percent said they would give up on farming as they did not see any alternative to burning. “Some farmers are unwilling to cultivate corn without burning since the yield will drop sharply and produce only a third or a quarter,” said Murniati, a scientist with FOERDIA. “They were afraid to use the burning techniques but they don’t have enough money to finance the no-burning techniques,” Murniati added, explaining that farmers are scared of incurring penalties for violating anti-burning laws but feel they have no choice but to face the risk. Since he got involved in sustainable agriculture, Taman has trained hundreds of farmers. He adds fertile soil, dolomite, and manure to his land and plants a variety of crops, including corn, chili, and vegetables. Initially, the cost of farming in this manner may seem more expensive, but over the long term it saves him money, Taman said, explaining the environmental benefits. Although burning more resistant vegetation is a less expensive and easier solution, it can strip nutrient levels in the soil and spoil the peatlands in the long run. As farmers, we need more support for infrastructure to lower costs, Taman said. Currently, poor infrastructure causes high costs for herbicides and harvested crops. Farmers are forced to rent cars to cover a short 250-meter distance because trucks cannot fit into narrow roadways. Finding other livelihood options might be key for helping local communities thrive while conserving peatlands, according to Dede Rohadi and Herry Purnomo, scientists with the Center for International Forestry Research (CIFOR) currently working with MOEF and several partners. The Haze Free Sustainable Livelihoods project led by CIFOR, MOEF and the University of Lancang in Riau aims to find alternatives for farmers who cultivate crops in the province. “We try to empower communities so they can maximize the existing livelihood potentials in their village,” said Rohadi, who leads the project. Some villages already cultivate honey, develop fisheries and grow food crops such as chili peppers and pineapples. In addition to the Haze-free Sustainable Livelihood project, CIFOR is currently coordinating the Community-based Fire Prevention and Peatland Restoration project with Riau University, local government, communities, and the private sector. The latest commitment from the governments of Indonesia, the Democratic Republic of the Congo and Republic of the Congo, to establish the International Tropical Peatland Center (ITPC) promise for peatland preservation efforts. ITPC is currently based at CIFOR in Bogor, near Indonesia’s capital Jakarta. It provides valuable opportunities for cooperation in the global south to ensure policymakers, practitioners, and communities have access to trustworthy information, analyses, and the tools needed to conserve and sustainably manage tropical peatlands. Although peatlands extend over only 3 percent of the world’s land mass, they contain as much carbon as all terrestrial biomass and twice as much as all forest biomass. About 15 percent of known peatlands have already been destroyed or degraded. Transboundary haze is a form of seasonal air pollution affecting up to six Southeast Asian countries on an almost annual basis. The first reports of this phenomenon emerged in the 1980s, and the most recent serious episode took place in 2016. The most affected countries are Indonesia, Singapore, and Malaysia. The particulate and aerosol matter that makes up the haze originates from forest and peat fires occurring during the dry season, mostly in Indonesia. When this permeates the troposphere and travels across national borders, it is known as transboundary haze. People take photos near the Singapore Flyer observatory wheel shrouded by haze, Aug 26, 2016. The countries and people within reach of this smoky shroud suffer serious health, economic, and environmental consequences during each episode. The fine particles in the haze permeate deep into the lungs, which can cause serious respiratory problems, especially among young children and the elderly, sometimes resulting in death. Ophthalmological, dermatological, and psychological issues are also commonplace. Sick days taken and school closures (during which parents often stay home to care for their children) cause significant losses in workforce productivity. These countries’ tourism industries suffer as well, as visitors have no interest in hazy skylines. Agricultural productivity and the general state of the environment also decline as the haze blocks out the sun and slows down photosynthesis. With the countries affected all situated within the Southeast Asian region, the Association of Southeast Asian Nations (ASEAN) was quickly looked upon to be the driver of a workable regional solution to the haze. ASEAN began to formally identify transboundary haze as part of its remit in 1985. However, despite various ASEAN agreements, initiatives, and task forces since then, the haze persists. The haze’s effect on member countries is dire, and its causes are seemingly well understood, so ASEAN’s continued inability to effectively mitigate it is puzzling. Scholars have laid the blame for ASEAN’s “failure” to solve the haze on weak regional governance; specifically, the limitations of its model of regional engagement through consensus, non-interference, non-confrontation, sensitivity, and politeness, as well as non-legalistic procedures – the so-called “ASEAN Way.” Describing this model as a “doctrine” to be adhered to at all costs, scholars such as Vinod Aggarwal and Jonathan Chow argue that member states’ desire to eliminate the haze has been unable to compete against the stronger desire to comply with the ASEAN Way. However, other ASEAN observers, such as Tobias Nischalke and Shaun Narine, have argued that member states do not blindly follow the ASEAN Way. Nischalke’s research uncovered many examples where the ASEAN Way was only moderately adhered to at best. This contention was the entry point of my research: has ASEAN been failing on the haze because states are duty-bound to adhere to norms that do not encourage effective regional environmental governance? Or have the states been choosingto adhere to these norms because it is in their interests to do so? If so, what are these interests, who has been shaping them, and why are they not in line with a haze-free ASEAN? To answer these questions, I spent six months in Indonesia, Singapore, and Malaysia conducting semi-structured interviews with over 100 individuals with experience in haze governance, including government and ASEAN officials, journalists, plantation company representatives, non-governmental organization workers, and academics. Fires on palm oil plantations, such as this one in Jebus village on the Indonesian island of Sumatra, are responsible for a great deal of transboundary haze. During these conversations, several points became clear. Firstly, the type of fire matters. While regular forest fires are most common, they usually burn tree canopies. This produces little smoke and often results only in short-term, localized haze. Peat fires, on the other hand, can spread below the surface, reaching soil. Carbon-rich soil produces especially thick and sooty smoke when burnt, and this smoke can travel great distances. These fires are also harder to put out. Hence, a small amount of fires (on peatlands) are responsible for a large portion of transboundary haze. Secondly, peat is not naturally fire-prone. In their natural state, peatlands are flooded year-round – fires only occur when peatlands are drained in preparation for planting. This dries out the peat and makes it flammable. Thirdly, due to the importance of peatlands as carbon sinks, Indonesian law generally does not allow these areas to be developed. Despite this, and due to the decreasing availability of mineral soil, an increasing amount of peatlands have been opened for agriculture, especially for palm oil. A trend emerged, where the increasing severity of the haze matched the region’s palm oil boom in recent decades. Further interviews revealed that large plantation companies, both local and from Malaysia or Singapore, have managed to obtain licenses to access peatlands to plant crops like oil palm. Some of these companies deliberately use fire as the cheapest and quickest way to clear the land for planting. Even if these companies do not deliberately burn, the act of draining these lands makes them prone to accidental fires. I found that strong patronage networks in this sector have enabled this to happen. Patronage is defined as a situation where an individual of higher socioeconomic position (patron) uses his influence and resources to provide protection or benefits for a person of lower status (client), who reciprocates by offering support and assistance to the patron. In this case, government patrons have provided the benefit of licenses to their clients, the business elites who own or are affiliated with these plantation companies. Furthermore, clients have also enjoyed their patrons’ protection from prosecution for haze-producing fires. A woman looks towards the Prime Minister’s office, which is shrouded in haze, in Putrajaya, Malaysia on Oct 6, 2015. These networks are at work even at the ASEAN level. When they represent Indonesia at ASEAN, the patrons are still compelled to protect their clients. An effective ASEAN haze mitigation strategy would mean that their clients would lose access to lucrative income, and risk being prosecuted. Hence, these patrons choose to use the ASEAN Way, especially the principles of non-interference and non-legalistic procedures, to block any meaningful strategies. Malaysian and Singaporean patrons follow suit, as they also act to protect their own complicit companies. I argue that these patronage networks better explain the decisions made at the ASEAN level that have led to the failure of the bloc to solve the haze problem. Since my field research, there have been some positive developments. The government of Singapore has shown a shift in its national interests, away from protecting its clients and toward the well being of its people. After several public displays of frustration with ASEAN’s lackadaisical efforts, Singapore ultimately passed its landmark Transboundary Haze Pollution Act in 2014, which empowered its courts to prosecute any party (even non-Singaporean) found to have caused haze in Singapore. Singapore, however, has not yet been able to use this act in court, largely due to the non-cooperation of Indonesia. While ASEAN member states still meet regularly to strategize on haze matters, the strategic use of the ASEAN Way continues to limit any meaningful progress. However, as Singapore has shown, change is not impossible. I remain hopeful that other member states will eventually follow in Singapore’s footsteps to act in the common interest of the people of the region. Helena Varkkey is a senior lecturer in the Department of International and Strategic Studies at the University of Malaya. She received her PhD in international relations from the University of Sydney in 2012 and her first book, “The Haze Problem in Southeast Asia: Palm Oil and Patronage,” was published by Routledge based on the above research in 2016. This article was originally published in AsiaGlobal Online, a Hong Kong-based source of Asian perspectives on global issues. The News Lens has been authorized to republish this article. A cap-and-trade system helped to eradicate acid rain in the 1990s. Could Southeast Asia’s haze problem be beaten in the same way? American Financial Exchange chief Richard Sandor thinks so. Acid rain was a major environmental problem in the 1970s and 1980s. The phenomenon was caused by the reaction of sulfur dioxide and nitrogen oxide from power factories with moisture in the atmosphere to generate acid, which fell onto earth as rain, poisoning lakes and destroying forests. The situation began to improve in 1990 when the United States government and economists introduced a cap-and-trade system for power producers, which put in place a cap on permitted emissions and enabled companies to trade leftover allowances, said Richard Sandor, chairman and chief executive officer of the American Financial Exchange, an electronic exchange for financial institutions. Sandor, who played a key role in orchestrating the cap-and-trade scheme to tackle acid rain, was speaking at a lecture organized by the National University of Singapore in the Southeast Asian city-state. “The idea was to put a cap on the number of emissions nationally, and then lower the cap over a period of time,” he said. There was the outcry that electricity prices would skyrocket, America’s competitiveness would be hurt, and power-producing states such as Ohio or Illinois would go bankrupt. Instead, a decade after the first cap-and-trade programme was implemented, emissions were down to around 4 million tonnes from a high of 18 million in the 1980s. But could market-based solutions solve the persistent problem of transboundary air pollution in Southeast Asia, asked moderator Tommy Koh, ambassador-at-large for Singapore’s foreign ministry. Also known as the haze, it is caused by forests fires in Indonesia as land is cleared for palm oil plantations, said Koh. Sandor offered two pieces of advice: to create a regional solution and to put a price on pollution. Drawing from the example of acid rain, he said that the creation of local laws to regulate emissions from coal-fired plants resulted in utility companies building taller smokestacks so that emissions would blow into another state where the regulations didn’t apply. “We thought of sulfur dioxide as a local problem, but it was as regional as [the haze] in Southeast Asia. It requires a regional agreement because local command and control, where there are externalities involved, just doesn’t work,” Sandor said. When told that Asean—a political bloc of 10 Southeast Asian countries—already has an agreement to combat the haze, Sandor said pricing could be another solution. Cap-and-trade markets work because companies find that it pays to pollute. “The question is, how do people get paid not to pollute?” he said. If polluters realize they could make money from cutting emissions—by selling leftover emission quotas, in the example of acid rain—they would do it. Sandor was optimistic about the future of blockchain-based market trading, which could also empower small producers to access bigger markets. There has been a lot of hype and speculation around cryptocurrencies, which are digital tokens whose transactions are recorded on the digital open ledger that is blockchain technology, he said. But the underlying blockchain technology is much more impactful as it can be used to facilitate trade in clean energy, as seen in South Africa’s Sun Exchange platform WePower from Lithuania, Sandor explained. Recalling his work in Kerala state in Southern India in 2007, Sandor said he and the Chicago Climate Exchange partnered a non-governmental organization to encourage farmers to collect manure and process it using biodigesters. The methane produced was used for household cooking, and the carbon credits produced sold on the Exchange to provide additional income. But a key obstacle was the need to travel to these remote villages to verify the carbon offsets were indeed being made, noted Sandor. “If we had the blockchain and remote sensing … we could’ve reached 20 million rural poor [versus 150,000] because all they would’ve needed were cell phones and remote sensors and I could’ve built a blockchain registry,” he said. As 2018 comes to a close it is worth taking a look at the environmental trends throughout the year, with a special emphasis on those within the last six months or so, in order to gain an understanding of what has been happening to this region’s natural heritage and so that we might know what to look for in 2019—and how to address the upcoming challenges. While we can say that a lot has been happening everywhere, and this is especially true for Malaysia. The country produces durian that Chinese consumers covet. This means rainforests that are currently home to tigers are being converted into plantations so that more and more of the spiky, pungent fruit can be sold to China. That means bad environmental news, with China the driver. Furthermore, clearing forests will drastically reduce the number of pollinators such as bats and other wild animals, which will, in turn, lower the durian’s quality. Another fruit—palm oil—is almost always the whipping boy for conservation problems in Malaysia (and beyond), however, the country is making headway in its own sustainable certification program, which attempts to incorporate Environmentally Sensitive Areas (ESAs) into development blueprints across Malaysian Borneo. Nonetheless, huge development projects in Peninsular Malaysia are pushing the environment to the breaking point, with gargantuan Chinese-funded residential projects such as Forest City across the strait from Singapore serving as a striking case in point. However, Prime Minister Mahathir Mohamad recently shut down several Chinese Belt and Road projects. Malaysia also wants to ban importing plastic waste, as well as single-use plastic straws. Nonetheless, serious problems remain. Even without the durians-to-China issue, tiger numbers are tumbling fast, scenic Langkawi island is coming under so much stress that it may lose its Unesco status, while in Sarawak the forest-dwelling Penan indigenous group continue to block bulldozers and fight for their traditional lands. However, a rehabilitated Bornean orangutan was successfully rewilded in Sabah’s Tabin Wildlife Sanctuary, the first orangutan to fully return to the forest after such a long spell in captivity and rehabilitation, and a clouded leopard was sighted within the vicinity of a local hospital. Forest fires raged in South Sumatra and Riau provinces in 2018, and Chinese developers are stubbornly pushing ahead with a hydroelectric dam in the Batang Toru forest, home to the rarest species of the orangutan in the world. The Critically Endangered Sumatra rhinoceros is still in big trouble but there is a movement on to save it, while a pregnant Sumatran tigress was caught and died in a pig trap in Riau. Like Malaysia, Indonesia has a major palm oil problem, but the country’s anti-graft department says it’s ready to take action against transgressors who are felling natural forest and breaking other laws. Sadly, the Bali government wants to build an elevated highway right on top of some of its last undeveloped sandy beaches. The small volcanic island of Krakatoa in the Sunda Strait between Java and Sumatra has spewed lava and ash this year. Widespread deforestation, poaching, overfishing, and plastic pollution has been taking over this island nation. Indonesian Presidential contender Prabowo has said that if he is elected to office he will review China’s Belt and Road plans, which could include a cancellation of the Batang Toru dam, and a court in Aceh recently threw down its stiffest penalty to date for two men caught trying to sell a tiger pelt. Asia Sentinel recently reported on the surprising amount of wildlife to be found in Singapore today. Thailand also received high environmental marks in a recent Asia Sentinel critique, however, Thai-language media recently uncovered a story about a Vietnamese national caught with tiger bones in the kingdom— particularly worrying report as Vietnamese poachers are among the most tenacious in Asia. Making matters worse, a new and improved road through Kaeng Krachan National Park will likely lead to greater disturbance to the forest’s wildlife, while a few provinces to the north a Burmese national gunned down a binturong. There is rising sentiment to build a Kra Isthmus Canal in Thailand. A large crocodile was caught off the Krabi coast, a whale shark was recently spotted of Koh Racha, and local conservationists have thus far succeeded in fending off a new marina development project in Phuket. However, the deluge of Chinese tourists into the kingdom is pushing Thailand to its breaking point, and it was largely Chinese tourists who are responsible for the closing of Maya Bay in Koh Phi Phi, which remains closed indefinitely so that it can recover. In Laos, the Nam Theun 2 Dam has been such a disaster that its main financier, the World Bank, has thrown in the towel and walked away. In Dead in the Water: Global Lessons from the World Bank’s Hydropower Project in Laos contributing author Glenn Hunt remarks: “For one of the pillars that were supposed to be the primary source of income, it’s been an unmitigated disaster.” With about 140 dams either under construction or on the drawing board in its quest to be the “battery of Asia,” Laos faces the potential for most disasters and large-scale environmental and social degradation in a country that has already lost its wild tigers, leopards, and many other species. Despite the tragedy that unfolded in Attapeu province when a large dam collapsed, Laos remains bullish about constructing more dams. And the dam-building frenzy is harming the environment and wildlife all around the country. And while a recent Guardian write-up describing the fantastic-look am Et-Phou Luey ecotourism program up in the north of the country describes a healthy tiger population in this region, perhaps the author was given old data. Wild elephants are reportedly being skinned alive in Myanmar to satisfy a new Chinese demand—for “blood beads,” which are blood-filled chunks of elephant fat. The previous link provides a window into some twisted tastes: “The online trader wants his customers to know the elephant was skinned quickly, with blood still fresh in its veins.” Chinese demand for elephant skin used in bags in jewelry was already shocking, but things can always get worse when it comes to wildlife. But in more uplifting news from the country, Irrawaddy dolphins are being given greater protections, and the government is also cracking down on illegal wildlife trade in the city of Yangon. Taking note of how poorly elephants working in tourism are treated across Asia, Vietnam has launched the region’s first “ethical elephant experience.” The country has also taken an interest in seeing that its shrimp farming industry become more sustainable, while the government also recently signed a deal with the EU that promises a reduction in illegal logging (though some in neighboring Cambodia have serious doubts about this). We reported earlier this year that Vietnam’s wildlife is in rough shape, and things haven’t taken much of a turn for the better since. And finally, Cambodia. A recent camera-trap check-in Virachey National Park so delighted the Ministry of Environment that he shared some of the photos on their Facebook page; even the Thai media took notice of the results. Asia Sentinel reported earlier this year that Cambodia is probably the last hope for Indochina’s wildlife, and this still holds true, despite the fact that nearly 110,000 snares were found in a single national park. A man was recently killed by a wild boar near the Cardamom Mountains, while Kratie province is cracking down on illegal mining, and at the same time, the central government is demanding that villagers who grabbed national park land return it. In other news from the region, the Maubere tribe of Timor-Leste is bringing back ancient customary laws to help protect its forests, seas, and coastline. Chinese demand for logs is wiping out the forests of the Solomon Islands. India is losing tigers and elephants, while two elephants were struck by a train and killed in Sri Lanka. As always, China casts a menacing shadow over Southeast Asia and nowhere is this more clear than on the Mekong River and in the South China Sea. The region, with the help of the US and Japan, must find a way to manage Chinese aggression in the South China Sea and beyond, and then some of the numerous dams that it has planned for the region have to be canceled or scaled down. Beyond that, Chinese citizens have to be educated about wildlife product consumption, including shark fins, tiger parts, bear gallbladder, elephant skin and blood, and much more, which have no known scientific value. And in a shocking and disturbing announcement, China has said that it will lift its decades-old ban on the trading of tiger parts and rhino horn, a move that will almost certainly put these species in greater danger. Or else one of the most biologically rich regions of the world loses everything that made it so special. Gregory McCann is the Project Coordinator of Habitat ID, and the author of Called Away by a Mountain Spirit: Journeys to the Green Corridor. You can support his conservation projects in Cambodia and Sumatra here. Cambodian Prime Minister Hun Sen promised on Sunday that he would fix his country’s problems with rampant deforestation by shooting those who illegally chop down timber from helicopters. “It’s correct that we are losing our forests, many are being replaced by rubber plantations,” he said, speaking to members of the Cambodian diaspora in New York. Hun Sen made a similar promise two and a half years earlier when he announced that General Sao Sokha, newly appointed as head of a task force to stop illegal logging and timber smuggling, was authorized to fire rockets at loggers from helicopters. That order came a year after a Global Witness report showed that Hun Sen’s own personal advisor, Try Pheap, headed an illegal logging network that saw millions of dollars of rosewood smuggled to China each year. Not a shot has been fired from helicopters since that order and the task force did not succeed in halting the flow of luxury timber across Cambodia’s borders to Vietnam. Hun Sen’s relatives have also long been linked with the country’s illegal timber business. With hectares of forest falling to loggers and economic land concessions dished out by Cambodia’s ruling party, the country has one of the world’s highest rates of deforestation. Global Witness meanwhile estimates that evictions that have resulted from logging and the government giving land to agribusinesses have displaced 830,000 people, forcing some into squatting in state forests or cutting down timber themselves. Speaking Sunday, however, Hun Sen emphasized that it was the country’s now-defunct opposition–whose leader is in exile and whose deputy leader is just out of prison–that should be blamed for illegal logging. “In many cases [the thieves] went to cut down millions of hectares to cultivate farmlands, including groups [affiliated] with the former opposition,” he said. TEMPO.CO, Pekanbaru – Meteorology, Climatology and Geophysics Agency (BMKG) detected 12 hotspots in Riau Province, which became an early indication of forest and land fire, on Tuesday morning. Based on the data from BMKG Pekanbaru Station that was updated at 7:00 am, Riau still dominates the number of hotspots on Sumatra Island since the beginning of this week. In total, there are 23 hotspots in Sumatra, and 12 of them are in Riau. There are five hotspots in South Sumatra, three in Lampung, two in Bangka Belitung, and one in Bengkulu. Head of BMKG Pekanbaru Station, Sukisno stated the number of hotspots increased compared to on Monday afternoon, September 24, which was 11 hotspots. Of the 12 hotspots, the most were in Pelalawan District, five hotspots. In Siak and Meranti Islands, there were three hotspots and Indragiri Hulu has one hotspot. In addition, there were two hotspots that have a level of confidence above 70 percent. “These two hotspots are in Pelalawan and Meranti Islands,” he said. A new analysis of global forest loss—the first to examine not only where forests are disappearing, but also why—reveals just how much industrial agriculture is contributing to the loss. The answer: some 5 million hectares—the area of Costa Rica—every year. And despite years of pledges by companies to help reduce deforestation, the amount of forest cleared to plant oil palm and other booming crops remained steady between 2001 and 2015. The finding is “a really big deal,” says tropical ecologist Daniel Nepstad, director of the Earth Innovation Institute, an environmental nonprofit in San Francisco, California, because it suggests that corporate commitments alone are not going to adequately protect forests from expanding agriculture. Researchers already had a detailed global picture of forest loss and regrowth. In 2013, a team led by Matthew Hansen, a remote-sensing expert at the University of Maryland in College Park, published high-resolution maps of forest change between 2000 and 2012 from satellite imagery. But the maps, available online, didn’t reveal where deforestation—the permanent loss of forest—was taking place. Wildfires engulfed hectares of land in the Cikepuh and Cibanteng nature reserves in Sukabumi, West Java, between July and August. The West Java Natural Resources Conservation Agency (BKSDA) recorded that at least 27 hotspots, which were located on the savannah, had scorched about 232 ha of the two nature reserves’ total area, kompas.com reported. Kusmara of the BKSDA said the savannah was prone to fires during the dry season. The fires, he added, were also found inside the buffer zones close to land owned by local residents. “We are still investigating the cause of the fire because there is suspicion of illegal activities in the area,” Kusmara said on Monday, as quoted by kompas.com, without giving more information. Cikepuh and Cibanteng are part of the Ciletuh-Pelabuhan Ratu National Geopark, which gained global recognition as a UNESCO Global Geopark earlier this year. In September last year, fires razed at least 19 ha of forest in Cikepuh. Kusmara said the authorities were continuing to work to prevent further fires, including encouraging local residents to take part in wildfire prevention campaigns. JAKARTA/PONTIANAK/PEKANBARU — Like their compatriots across Indonesia, a group of residents in the Bornean city of Pontianak celebrated the country’s Independence Day on Aug. 17 with a flag-raising ceremony. But for them, the simple act of hoisting the Red-and-White was a physically taxing endeavor, thanks to the toxic haze billowing from a smoldering plot of peatland nearby. The sound of wood crackling in the fire could be heard as the participants, their surgical masks doing nothing to keep the smoke out of their eyes, stood through the ceremony. When it was over, they returned to what they were doing: working to put out the pockets of fire flaring up from the mulch-rich peat soil. Beni Sulastiyo is one of the leaders of this group of residents of Pontianak, the capital of the province of West Kalimantan, who have banded together as volunteer firefighters. He says they see the fire problem as something that the whole community, and not just the government, needs to address. “This should be a shared responsibility for everyone. As members of the community, we’re on the same page in helping the government,” he says. Ateng Tanjaya is nearly 70, and has worked as a volunteer firefighter in Pontianak for more than 40 years. The work is often thankless, he says, and the hardships legion: lack of hoses and fire equipment, shortage of water, and scant funding and logistical support. For these volunteers, the fires won’t end any time soon. The dry season is kicking in, and after a relatively haze-free 2016 and 2017, conditions this year look ripe for the fires to grow out of control. There have been nearly 2,200 fire hot spots recorded across Indonesia between Jan. 1 and Aug. 14, according to the Indonesian Forum for the Environment (Walhi), the country’s leading green NGO. West Kalimantan recorded the highest number of any province, at 779. At least four people are confirmed to have died in the fires in the province. The latest victim, a 69-year-old farmer in Sintang district, reportedly died while trying to put out a blaze on his land on Aug. 19. Six days earlier, a family of three in Melawi district died in their burning house. In Pontianak, the haze has sometimes been so thick that visibility is limited to 5 meters (16 feet). Flights into and out of the city’s Supadio International Airport are under constant threat of being cancelled or diverted whenever visibility drops below 1,000 meters (3,300 feet). Elsewhere across the province, schools were ordered shut on Aug. 20 when the haze worsened. Satellite imagery from the Global Forest Watch platform shows smoke plumes in the most affected areas, including Pontianak and Ketapang district. Air quality in Pontianak has been declining in recent weeks, according to data from the national weather agency, the BMKG, uploaded to the global monitoring platform IQAIR Air Visual. This has been marked by an increase in the concentration of tiny carcinogenic particles known as PM2.5 in the air. These particles are small enough to enter the bloodstream; long-term exposure to them can cause acute respiratory infections and cardiovascular disease. PM2.5 concentrations crossed into dangerous territory on Aug. 19 and 23, when the average daily levels registered at 73.5 and 79 micrograms per cubic meter, respectively — triple the World Health Organization’s guideline level of 25 micrograms per cubic meter in a 24-hour period. It’s a similar story across the Karimata Strait from Borneo, on the island of Sumatra. Norton Marbun, a resident of Rantau Benuang village in Riau province, says the fires there began on Aug. 14, razing the villagers’ oil palm farms. He was out in the fields helping fight the flames, he says, and almost didn’t notice the fire closing in on his house, where his wife and children were sheltering. He rushed back to find the house, which he’d just finished building three months earlier after 11 years of saving up, filled with smoke. His wife didn’t want to leave — the house was all they had, she said — and Norton says he had to drag her and the kids out as the flames bore down. They were barely out when a gas canister exploded inside the house. “If I’d been even 10 minutes late, maybe my family would have been skeletons inside the house,” Norton says. They lost everything with their house, including two motorcycles. The family has since moved to a neighboring village. But even there they can’t escape from the haze. “Now my children are having difficulty breathing due to the haze,” Norton says. Forest and peat fires are an annual occurrence in Indonesia. In 2015, the country suffered one of its worst burning seasons in years, with more than 20,000 square kilometers (7,700 square miles) of land razed — an area four times the size of Grand Canyon National Park. The resultant haze sickened hundreds of thousands people in Indonesia and spread into Malaysia and Singapore. On the heels of that disaster, President Joko “Jokowi” Widodo announced a series of measures aimed at preventing future fires. These include an ambitious plan to restore 24,000 square kilometers (9,300 square miles) of degraded peatland and imposing a moratorium on peat clearance. The policies seem to have paid off, with a significant reduction in the number of hotspots in 2016 and 2017. Last year, officials recorded zero days with haze resulting from forest fires. The government has repeatedly cited those figures as proof that its policies are working. But some of this year’s fires have flared up in regions prioritized by the government for peat restoration, including West Kalimantan and Riau. Walhi, the environmental watchdog, says it has detected hotspots within peat hydrological units, the areas of peatland bordered by rivers or other bodies of water. “The fact that this year the number of hotspots is very high in West Kalimantan shows that efforts to improve peat governance in the province have failed,” Anton P. Widjaya, director of Walhi’s West Kalimantan chapter, said at a recent press conference in Jakarta. He said Walhi had compared the number of hotspots in peat areas before and after the government launched its program under the auspices of the Peatland Restoration Agency (BRG), and found no improvement. Riko Kurniawan, the director of Walhi’s Riau chapter, said the return of the fires in the province this year showed the government’s programs had been boosted in the previous two years by a less-severe dry season. BRG head Nazir Foead says the government’s peat restoration efforts might not be enough to prevent this year’s fires simply because of the sheer size of peat areas that have been degraded and are thus prone to burning again. He cites the case of a village in Riau that was included in the peat restoration program last year. The village is surrounded by dozens of square kilometers of peatland that have to be rewetted to prevent fires from breaking out. To this end, the villagers blocked the canals that were previously dug to drain the land in preparation for planting. But the work only took place two months before the onset of the dry season, and not all of the canals could be blocked in time. “And indeed, fires happened this year on the edge of the village that hadn’t been restored yet,” Nazir says. Even after drainage canals have been blocked, it can take years of rains before a peat area is restored to its original wet, sponge-like condition. In addition to working with villages that are prone to fires, the peat restoration program also requires companies to restore degraded peatland inside their concessions. The Ministry of Environment and Forestry has approved the peat restoration plans of 45 timber plantation companies and 107 oil palm and rubber plantation firms, according to Karliansyah, the ministry official in charge of environmental damage mitigation. The ministry is still waiting for 80 more oil palm and rubber plantation companies and more than 30 timber plantation companies to submit and revise their restoration plans, he added. The ministry’s fire mitigation chief, Raffles B. Pandjaitan, says this year’s increase in hotspots coincides with the start of the land-clearing season in West Kalimantan, where local farmers practice a traditional method of slash-and-burn called gawai serentak. He says the farmers take advantage of the dry season, which peaks in August and September, to burn their land, after which they begin planting. Walhi has refuted the government’s claim, saying many of the hotspots it has detected are in the concessions of large companies, not the farms of smallholders. The group says there have been 765 fire spots in corporate concessions so far this year. Walhi executive director Nur Hidayati says it’s likely the government is blaming smallholders for this year’s fires because its own firefighting efforts so far have been focused on areas close to these villages. “But [fires on] companies’ concessions that are far from villages are being ignored,” she told Mongabay in Jakarta recently. Walhi spokeswoman Khalisah Khalid says that while some indigenous communities continue to practice slash-and-burn clearing, they do so in a way that keeps the fire contained. This keeps the fires from spreading outside the communities’ land and damaging the environment, according to a 2016 Walhi study on how traditional communities manage peatlands. She also notes that a 2009 law that allows smallholders to clear land by burning up to 2 hectares (5 acres) — a stipulation aimed at preserving traditional methods of land clearing. By blaming traditional farmers for this year’s fires, the government has failed to understand the importance of local wisdoms about farming on peat, Khalisah says. Walhi attributes the outbreak of fires this season on companies that went unpunished for previous fires and were thus emboldened to continue to the practice. The government itself is also to blame for preventing the fires. That, at least, is the judgment of a court in Central Kalimantan province, which recently ruled in favor of a citizen lawsuit calling on the president and various ministers and other senior officials to be held accountable for the 2015 fires. In their suit, the plaintiffs argued that the government failed in its duty of protecting residents of Central Kalimantan from the impact of the fires. The respondents in the lawsuit include the president; the ministers of environment, agriculture, land, and health; and the governor and provincial legislature of Central Kalimantan. The government, however, is appealing the case to the Supreme Court, to the dismay of activists. Walhi has also called on the authorities to take action against companies with fires on their concessions, instead of going after local farmers. The environment ministry in mid-August sealed off concessions held by five companies in Kubu Raya district, West Kalimantan. It did not identify the companies by name. Banner image: A group of locals in West Kalimantan participates in a flag-raising ceremony amid toxic haze from nearby peat fires. Image by Aseanty Pahlevi/Mongabay Indonesia.